Our Gym Near Shah Alam Seksyen 13 has officially opened in February 2018.The built area is 1000 square feet. Our gym is also located strategically in the Shah Alam area about 5 minutes drive from Seksyen 13 in Shah Alam, Malaysia. It is equipped with wood floors and an ample space to run, skip and conduct our complete routine fitness class. Malaysia is flourishing and affluent and has a number of fitness classes offered today, but very few exercise programs exist that target the empowering of women by guiding women to believing in themselves while training. Feminine Fitness Force has locations in Shah Alam, Malaysia. From the selection of workout variations and modifications to the organization of the motivational speakers, Feminine Fitness Force creates a supportive and profound experience that will make you feel healthy, confident, energetic and more. Our first Class is always free. It's time for a change. Come join a GYM with a wonderful group of women who care about your health and well being! Click the link to get your Free Class Pass. 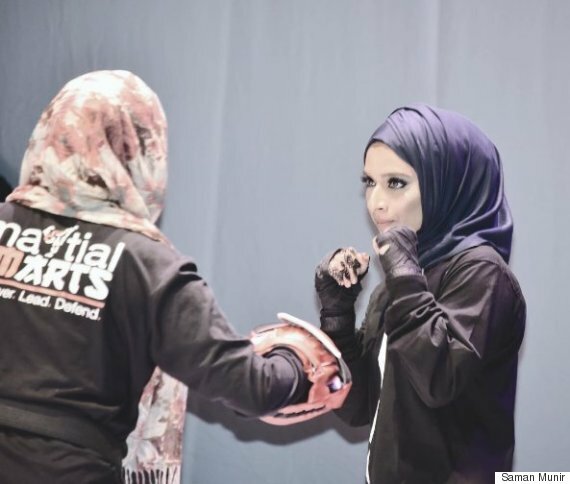 Tasneem Mughal, founder of Feminine Fitness Force, and certified CanfitPro instructor, has been well acquainted with women's only clubs for the past fifteen years. She has created Feminine Fitness Force in order to fill the need of self-belief she has seen incomplete in fitness services provided to women over the years.